“At every level, Japan’s literature reveals much about its culture, values, and mores. Poetry, proverbs, ghost stories, and novels old and new reflect themes from Japanese life, the Japanese connection with nature, Japan’s ingenious use of natural materials, and a love of bamboo, in particular. “A much beloved folk-tale known variously as ‘The Bamboo-Cutter’s Daughter’ or ‘The Shining Princess’ revolves around an impoverished old bamboo-cutter’s discovery of a beautiful miniature princess in a bamboo culm. Another favorite, ‘The Luck of the Sea and the Luck of the Mountains’, includes the character Shihotsuchi, whose antics involve bamboo in various ways. 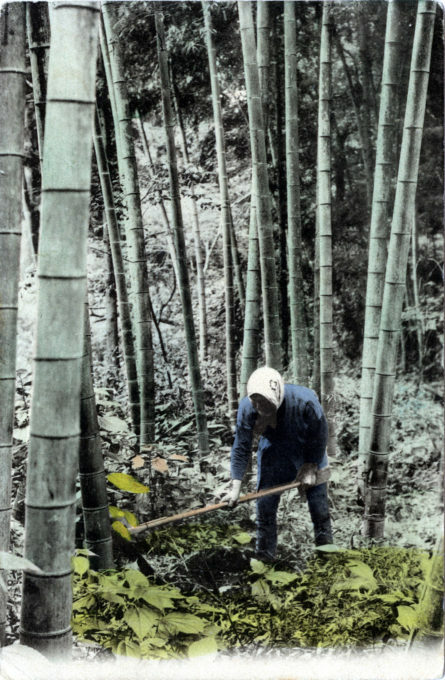 First, he flings a bamboo comb down to the ground and is rewarded with a bamboo grove; this he cuts down and weaves into a basket – bamboo three times over. In some stories, bamboo appears as it does in real life – as a pole to dry clothes, a fence to divide property, a basket, a backpack, or as young shoots.